For short we usually call this unique rose Rosa sericea subsp. omeiensis forma pteracantha. 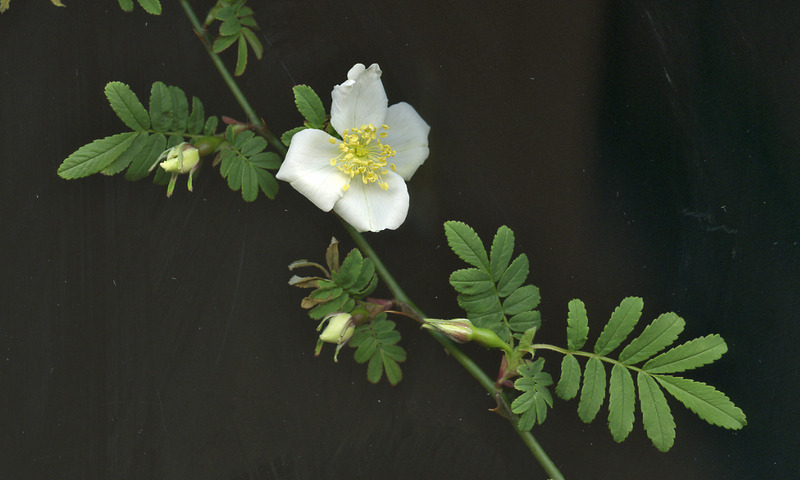 Taxon: Rosa sericea Lindl. subsp. omeiensis (Rolfe) A. V. Roberts forma pteracantha Franch. Family: Rosaceae subfamily: Rosoideae tribe: Roseae. Species priority site is: National Arboretum (NA). Rosa sericea subsp. omeienses Forma pteracantha is most vigorous and if left alone it would spread in every direction. You do not want this to happen near pathways as she has the most vicious thorns around. Technically roses do not have thorns but prickles. Rosa sericea subsp. omeienses Forma pteracantha’s prickles are exceptionally beautiful. They are translucent and red and when grown where you get a backlight they shine blood red. I like my Rosa sericea because it is a species rose. It is a rose in which man, and woman, have not tinkered with to “improve” it. I love it for its primitive nature. 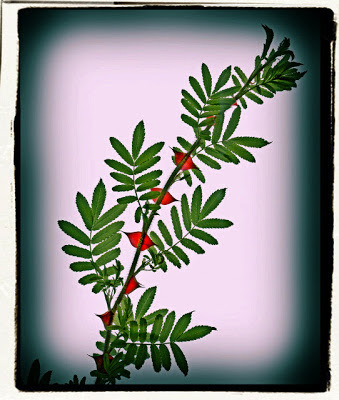 I have often wondered why botanist Giovanna Franchetti would have been involved in the naming of the rose as pteracantha. The name brings to mind primitive flying pterosaurs. All I could find is that the word pterosaur, has Greek roots, πτερόσαυρος, pterosauros, meaning winged lizard. What is winged about my Rosa sericea? Could those large prickles be like wings? I often wonder when I gaze upon the pale pink, almost white, Bourbon Rose, Madame Pierre Oger not only who Pierre Oger was but what do we know about his wife? There is nothing so I could go at length here on what I have invented about her! And there is that hosta, Hosta ‘Tokudama Flavocircinalis’. This hosta is not big. It is slow growing and I have had it in my garden at least 23 years, and yet, every time I notice its elegant variegation I think of a fierce and imposing Roman emperor that never was. Going into my garden is venturing into a past that was and that was not.